In Mexico, the advertising market has been gradually growing for the last couple of years. 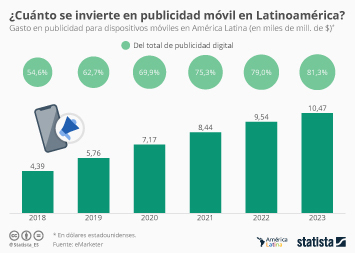 Forecasts indicate that the country will most likely remain one of Latin America's leading ad markets in the coming years, just behind Argentina and the regional leader, Brazil. The country's advertising spending is predicted to reach approximately 4.21 billion U.S. dollars in 2018. Although TV advertising accounts for over half of the total ad spend in Mexico, digital advertising is rapidly opening up and becoming one of the main mediums for advertisers in the country, expected to account for 19.2 percent of the total Mexican ad expenditure by the end of the year. In 2017, TV advertising expenditure amounted to an estimated 42.5 billion Mexican pesos for Free TV and eight billion pesos for Pay TV. Digital advertising spending ranked second in ad expenditure, with an investment in 2017 of approximately 15 billion Mexican pesos. Other important traditional mediums for advertisers in the country include outdoor, radio and printed media advertising. Within the digital segment, mobile internet had particularly positive figures, with an annual mobile ad spend in 2017 of 650 million U.S. dollars, up from 46 million only five years earlier. In Mexico, the automotive industry was the leading industry in mobile internet spending, followed by the retail industry, and the financial sector. In 2016, Procter & Gamble was the advertising agency with the highest ad investment in Mexico, with an ad spend of about 2.7 billion Mexican pesos. Meanwhile, the total ad expenditure of the federal government amounted to 10.7 billion Mexican pesos, the Secretariat of Health (SSA) was the agency spending the highest amount of official governmental resources on advertising.